Anything sprayable that is SAFE for birds..? Help?!?! I know there was a post made on this earlier, but I didn't want to piggyback so I made my own. Anyway I'm trying to buy a cage off someone from craigslist and I asked about the condition.. broken/bent/missing bars, chipped paint, etc..
And they said nothing broken bent or missing but they RESPRAYED it black to SHINE IT UP A BIT... I asked what they sprayed it with because spray paint is TOXIC to chew on but I'm really deterred from buying this cage and I'm *really* uncomfortable with thinking about them selling it to someone who doesn't know!!!! Re: Anything sprayable that is SAFE for birds..? Help?!?! Yeah this guy said he just used 'regular' spray paint .. so by that I assume he means whatever was cheap or already laying around. And he just did a "quick coat" because his mom's cockatoo died at the age of 15 (which is really young for a cockatoo...) and she couldn't bare to look at it. I wouldn't advice in getting the cage no. But he should know what he's doing is wrong! I tried to tell him politely, but that's really hard to do apparently.. 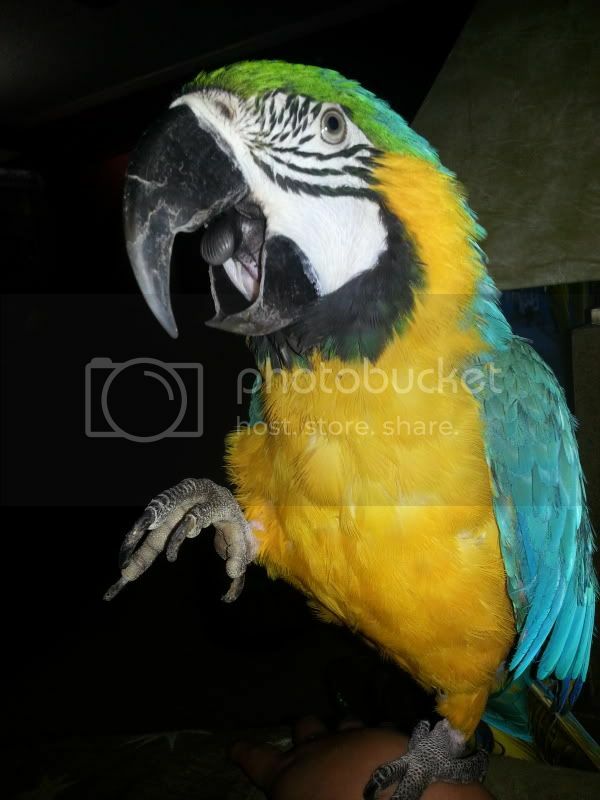 I just kindly asked him to inform any other potential buyers that he has spray painted the cage so they can make an informed decision, and let him know that most spray paint is toxic unless it's a specific paint and carefully applied.. but he just got pissy and replied "K thanks Whatever ur loss its a 500 dollar cage birds are known to eat the paint off cages..."
Okay... None of my birds eat the paint.. nor would I let them! If their cage was flaking or rusting anywhere I'd buy them a new one immediately. Yeah it just upsets me.. I wish people would be willing to learn!! I wouldn't pay $150 for that cage anyways, it's a tiny little used cage at a high price. I can practically buy a brand new one like it about the same price at the bird fair. Good luck to him trying to sell it at $175 There's someone locally here that's selling the exact same cage for lower then that and it's still being posted. I don't know what's the market like there, but at that price he'll be posting it forever here. Its a nice cage but I wish ding dongs like that didn't go around painting parrot cages with who knows what poison and selling it to non educated people! And that is a bit much for a cage like that! Eesh!